I have been advocating a proposal to make EDSA a one-way thoroughfare years back. I have been sending feelers to traffic authorities and even to MMDA just to take a closer look or make an engineering study on the possibility and feasibility of an EDSA one-way traffic flow. I just hoped that they have conducted the study although I have never heard of any response yet, whether conducted in an academic manner or thru media discussion. The worsening traffic condition, which Bangkok underwent before but was, resolved already demands a review as a template to resolve the chaotic condition of which we are experiencing on our major highway. Not that this column is trying to egg MMDA traffic authorities to act with dispatch but merely submitting a volunteered idea intended merely as an affable gesture, a friendly initiative. After all, there is no other agency involved in resolving street chaos than MMDA and it is one agency that deserves the participative involvement of anyone with ideas to share. EDSA (abbreviated from Epifanio de los Santos Avenue) is an important arterial road and freeway in the country’s metropolitan area. 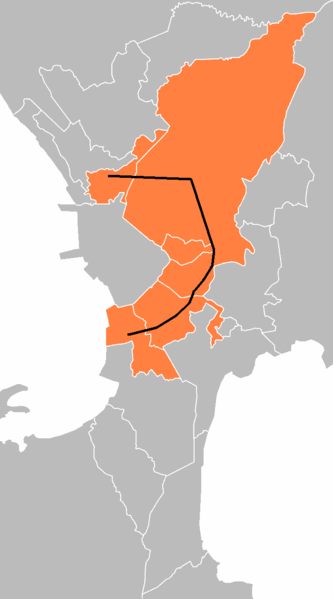 It serves the National Capital Region passing through 6 of 17 municipal and city settlements of Metro Manila. It is the longest and most congested highway and thoroughfare in the metropolis, stretching some 23.8 kilometers (14.8 miles) as it serves as a major north to south transportation corridor in the Metropolitan Manila. The entire road itself is a part of the Circumferential Road system, a network of roads and bridges that acts as a beltway of the City of Manila. The locations around the avenue were marked with great economic and industrial growth, proven by the fact that all but 2 industrial centers in the Metropolis are directly accessible from the thoroughfare. The decent economic growth of the areas around the avenue adds a significant volume of traffic on the avenue, and in recent estimates, EDSA handles an average of 316,345 cars daily (not counting the buses and trucks, including freight and long bed cargo transport units) and an average of 2.34 million vehicles go through EDSA every day. The road consists of 12 lanes, 5 for both directions with the elevated railroad (MRT) serving as its median for commuters. The average speed of vehicles in EDSA is 15 kilometers per hour (9.3 mph). An ordinary bicycle can run twice that pace. It has been noted that in the morning, southbound vehicles are literally moving snail pace. In the evening, the northbound side of EDSA is literally spilling to every lane. Various chokepoints are several meters dotting the entire stretch. Every stop is a virtual crawling incident. One can even get off his vehicle and just walk. On a regular day, the pedestrian may even reach his destination ahead of his commuting counterpart! If this is the daily grind in EDSA, I thought that a shift is necessary. A paradigm shift so to speak as scholars are wont to express for every untenable formulation reaching a blank wall. Instead of the so-called “counter-flow”, “zipper lane” or what-have-you, why not radicalize the approach further. Why not make EDSA a one-way thoroughfare. Just imagine transforming a 12-lane road into a one-way avenue. Makati’s streets were once upon a time a bottleneck template where the worst traffic congestion was the order of the day until they were made as one-way streets. The traffic became smooth, notwithstanding the stretch and inconvenience but the agony of not moving at all has been resolved. We could just imagine EDSA if it is a one-way thoroughfare, it could bearably contain and push smoothly the heaviest inflow of all vehicles at any given time. This is something controversial and may even indulge the courts for a temporary restraining order. It may even cause some heads to roll if not properly conducted. For sure the arrangement would ring several corners, mount numerous debates and push a lot of trouble. But these are matters which commuters encounter daily for years on end. Why not up the ante and let the rumble begin. Rizal’s novel is a prescriptive lesson. Expose the sick so that treatment will be coming. “Noli Me Tangere” or touch me not he wrote quite sarcastically. In this case, with my proposal, as Nike puts it JUST DO IT and hopefully regain the street as a medium for travelling easily. Posted on July 1, 2013, in Uncategorized and tagged Metro Manila problem, Traffic management, Traffic woes. Bookmark the permalink. 2 Comments.